Today I will discuss about Cisco Switch Port Security issue. Layer 2 interfaces on a Cisco switch are referred to as ports. A switch that does not provide port security allows an attacker to attach a system to an unused, enabled port and to perform information gathering or attacks. A switch can be configured to act like a hub, which means that every system connected to the switch can potentially view all network traffic passing through the switch to all systems connected to the switch. Thus, an attacker could collect traffic that contains usernames, passwords or configuration information about the systems on the network. Cisco Switch Port Security limits the number of valid MAC addresses allowed on a port. All switch ports or interfaces should be secured before the switch is deployed. In this way the security features are set or removed as required instead of adding and strengthening features randomly or as the result of a security incident. Note that port security cannot be used for dynamic access ports or destination ports for Switched Port Analyzer. Still, use port security for active ports on the switch as much as possible. The administrator can enable aging for statically configured MAC addresses on a port using the switchport port-security aging static command. The aging time command (e.g., switchport port-security aging time time) can be set in terms of minutes. Also, the aging type command can be set for inactivity (e.g., switchport port-security aging type inactivity), which means that the addresses on the configured port age out only if there is no data traffic from these addresses for the period defined by the aging time command. This feature allows continuous access to a limited number of addresses. 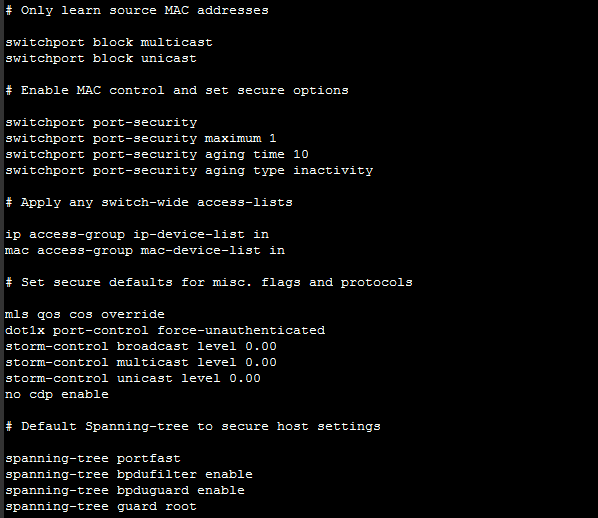 To restrict a port dynamically on a Catalyst 3550 switch use the following Cisco Switch Port Security commands. Note that the aging commands cannot be used with sticky MAC addresses. Note that when a port security violation occurs, the port will immediately become error-disabled and its LED will turn off. The switch also sends an SNMP trap, logs a syslog message and increments the violation counter. When a port is in the error-disabled state, the administrator can bring it out of this state by entering the errdisable recovery cause psecure-violation global configuration command or by entering the shutdown and no shutdown interface configuration commands.